Created to highlight Jordan's commitment to his college fraternity. If you've ever noticed the tattoo on the left side of Michael Jordan's chest or happened to catch him throwing up the 'hooks' with Shaquille O'Neal in the 1996 All-Star Game, you may know that MJ joined the Omega Psi Phi fraternity during his time at the University of North Carolina. Founded in 1911, Omega Psi Phi is the first predominantly African American fraternity to be established at a historically black university. The fraternity is dedicated to its Cardinal Principles of manhood, scholarship, perseverance and uplift. Other notable celebrity members include Reverend Jesse Jackson, Bill Cosby and Steve Harvey. Highlighting Jordan's commitment to the fraternity, the Jordan Brand created this special 'Omega Psi Phi' Air Jordan 18.5 Player Exclusive in 2003. This ultra-rare pair owned by Eric Hsieh aka @ahliang119 sports a white leather base, a black velour interior and Omega broidery replacing the usual Jumpman branding. 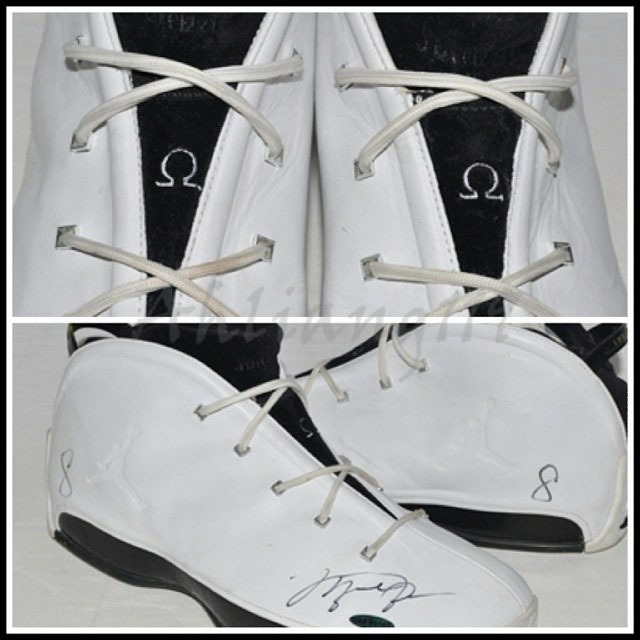 The left shoe is size 13.5 and the right is 13 — both autographed by Jordan and Upper Deck Authenticated. Have you ever seen another pair like this? If you may be one of the rarest pairs in existence.